Got to spend the better part of the day with Calvert Associate Campus Pastor Ross Howard, Worship Leader Terry Freeman, Calvert River Kids Coordinator Leah Lummus, 4RC Tech Director Zach Bishop & my wife lovely Stephanie. We did a great deal of technical work on the new 4RC Calvert facility. 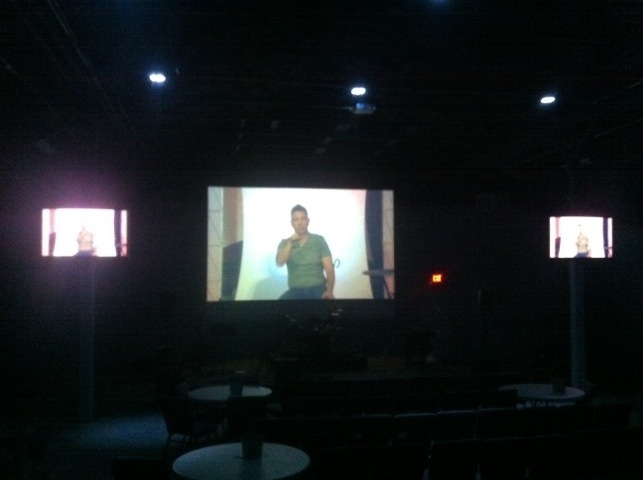 We hung big screens, ran lots of cable, worked on accent lighting, etc. In fact, when I left, Ross & Terry were hanging doors in the River Kids area. This weekend Dale Totten is planning on hanging the new sign on the front of the building. 4RC River Kids Director Sharon Stinson and her River Group will be working on the new middle school ministry room. Loads of work going on. Just in time for our weekend Easter services on Saturday, Sunday & Monday. Check FourRiversChurch.com for all Easter worship times & locations.